As winter dies down, I had been looking for other new things to crochet. The other day, I was scrolling through my Pinterest feed and came across a Very Hungry Caterpillar hat and cocoon set. I thought it was so cute! I'm done having babies, but one of my co-workers is expecting a baby this June. I thought it would be the perfect gift! So, I pinned several different patterns and set out to the craft store to find some yarn. Ideally, I wanted a yarn that had a lot of different colors. As you can see on the book cover above, the caterpillar's body has varying shades of blue and green. I had one yarn in mind that I had worked with before. My one son had gifted me two skeins of Loops & Threads Facets yarn in Capri Blue. It had shades of blue and green and yellow. But, sadly, it's only seasonal and wasn't available. Though, when I went out to buy yarn, I wasn't even thinking that it wouldn't be available at Michael's. I just knew Michael's wasn't having a sale that week and A.C. Moore was. So, that's where I went. I probably spent 15 minutes in the yarn section, looking for a yarn that would have the same colors. After almost giving up, I spotted a skein of Premier Yarns Puzzle in Cryptic. It's a self-striping yarn with blues and greens. Plus, it's a bulky weight yarn, so I thought it would work up quickly. I didn't find an exact pattern for both the hat and cocoon that I wanted to use. So, I ended up mixing up two different ones I had seen. 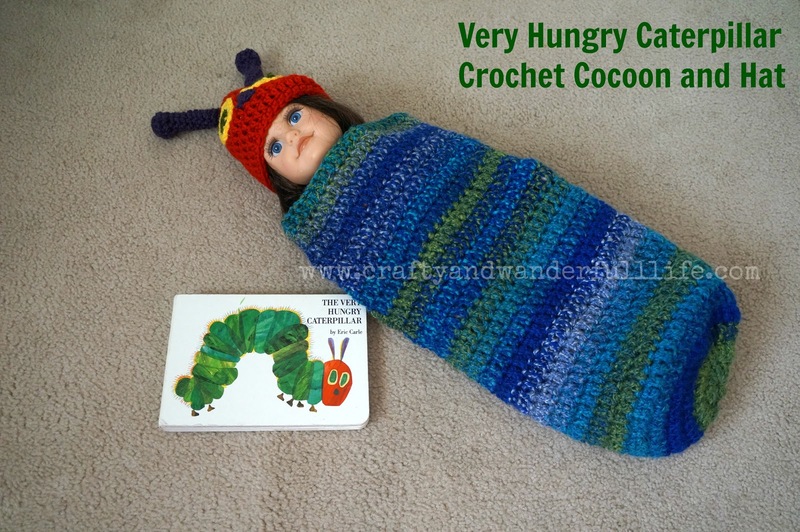 For the cocoon, I used the Baby Caterpillar Cocoon pattern by Posh Patterns. I followed the pattern, except I started with a Magic Ring instead of the chain 3 and slip stitch. Having forgotten how big a newborn baby was, I worked the cocoon until it was about 16 1/2 inches long. 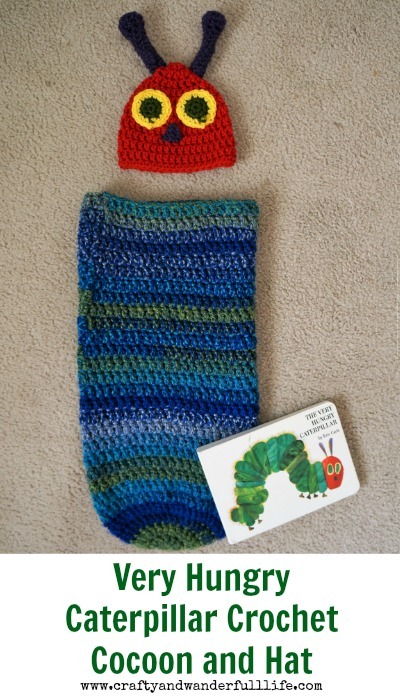 For the hat, I used the Newborn Caterpillar Hat and Cocoon pattern by Oui Crochet. Everything worked up pretty quickly, since they're so small. The hardest part for me was sewing the antenna on and keeping them standing up. I think if I make this again, I might put a little bit of fiberfill in them. 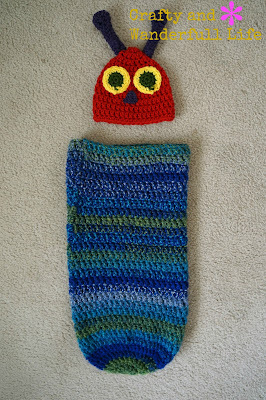 Since I have no baby to model the cocoon with, here it is with my daughter's baby doll. I'll post another picture if my co-worker sends me one when she does Newborn Photos.